VICENZA, Italy -- He was a penniless, traumatized Vietnamese teenager with a fifth-grade education when in 1980 he arrived in the U.S. He knew how to survive in the jungle, evade checkpoints and control the terror he often felt. But he couldn't speak more than a few words of English and had little practice in how to live a regular life. Yet within seven years after his American arrival, Lap The Chau had a new name, a degree from the Virginia Military Institute and a career as "an officer in the greatest Army on Earth," as he put it. Brig. Gen. Lapthe Flora, as he's now known, is deputy commander of U.S. Army Africa and assistant adjutant general of the Virginia National Guard. He is thought to be the only Vietnamese "boat person" to become a general officer in the U.S. military. "After what I went through, practically death, and then somebody gives you that opportunity to live again, I can only say from my own perspective that I'm very grateful for what this country has done for me," Flora said. 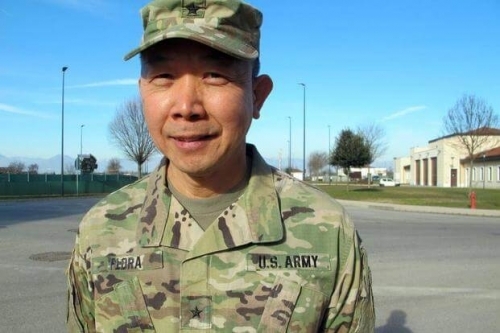 "The possibility in this great nation is boundless; the American Dream is real, only if you dare to pursue it with laser-focused hard work and perseverance," Flora said in speech when he was promoted to brigadier general more than two years ago. "There's no one who can get to where they are on their own. You need help," he said in a 2017 talk at the Raleigh Court United Methodist Church in Roanoke, Va.
"We had a house for them. They came with nothing," said Sharon Alexi, a former kindergarten teacher active in the church, who helped settle the 11-member Chau family. "They caught on very quickly," she said. "It was fun. It was a joy." "People thought they were crazy," Flora said. "But they took me in." "I benefited greatly from the U.S.'s decision to accept me into this country," Flora said. "I'm extremely grateful for the circumstances that led to my citizenship." In the end, nearly all of his family arrived in the U.S., including his future wife, his mother and a long-lost sister who'd been given up for adoption in Vietnam. "I don't like to think about hypothetical paths my life could've taken," Flora said. "Instead, I focus on the future and my ability to give back whenever possible and sharing my story to inspire others." At 11, as the Vietnam War raged throughout the countryside, Flora worked as a live-in servant at a factory. That ended on April 30, 1975, when the North Vietnamese and Viet Cong captured Saigon, South Vietnam's capital, ending the war and turning all of Vietnam into a socialist, one-party state. The new communist government instituted "re-education camps" and other repressive measures against political opponents and those who had collaborated with the Americans. "We sang in the middle of the night," Flora said. "It was kind of fun." "We knew there was less than a 50 percent chance of survival," Flora said. "Desperation, destitution will drive people to do anything." He took to the spartan school, his adoptive father's alma mater, saying it reminded him of his early schooling in Vietnam. He's encountered little discrimination since coming to the U.S., he said, and any slights are easily ignored. "You feel sorry for their narrow-mindedness," Flora said. From the start of his military career, Lapthe Flora made an impression. As a young lieutenant with the 116th Infantry Regiment in 1991, when Capt. Eric Barr met him, it was clear it wasn't just his backstory that made him unique. "It just jumped out at me that Lapthe was one of the most professional, squared-away officers," Barr said. "It was just obvious he knew his business." On a 2007 deployment to Kosovo, "whenever something really tough came up, Lapthe was known as the go-to person," said Barr, now a retired colonel. "Where it really stood out, he had so much credibility with the Serbs and the Albanians because they knew he had lived their lives," Barr said. "He had been through the same hell they had been through." � Copyright 2019 Stars and Stripes.